Before he has even had a chance to form a new government, Prime Minister Benjamin Netanyahu is already under pressure from new US Secretary of State John Kerry to return to the negotiating table and make concessions to the Palestinians. The very day after Kerry phoned Netanyahu and Palestinian leader Mahmoud Abbas, Palestinian officials began listing preconditions for even meeting with the Israelis. Among those preconditions: The immediate release of all jailed Palestinians, most of whom have either tried or succeeded in killing Jews, and a full halt to the building of homes for Jews in areas claimed by the Palestinian Authority, including the eastern half of Jerusalem. Both are red lines no Israeli government could cross, even one headed by the left-wing Labor Party. Israeli leaders from across the political spectrum have blamed Abbas and his regime for scuttling peace talks over the past four years by refusing to talk without preconditions that would prejudice the outcome of negotiations. Ahead of US President Barack Obama’s visit and increased American pressure to restart the stalled Israeli-Palestinian peace process, Prime Minister Benjamin Netanyahu on Monday stressed that he has never abandoned his willingness to help establish a Palestinian Arab state. In 2009, Netanyahu delivered a speech at Bar-Ilan University in which he made his first public statement of support for a Palestinian state as the outcome of the peace process. Speaking to Jewish leaders in Jerusalem on Monday, Netanyahu said he stands by that policy. “I believe that a framework to peace (with the Palestinians) is what I outlined in my speech in Bar-Ilan University – two states for two peoples: A demilitarized Palestinian state that recognizes the Jewish state,” said Netanyahu. Unfortunately, continued Netanyahu, it has been impossible to negotiate this outcome in good faith because “time after time” the Palestinian leadership places unacceptable preconditions to even returning to the negotiating table. Of course, even if talks were to be restarted, the current Palestinian leadership has already made abundantly clear that it will never recognize Israel as the rightful and natural homeland of the Jewish people, nor will it agree to be demilitarized. Former Foreign Minister Avigdor Lieberman on Saturday told Israel’s Channel 2 News that this is all just diplomatic speak for the sake of public consumption. “Anyone who thinks that in the center of the diplomatic, political and social tsunami that is shaking the Arab world it is possible to get a magical solution of comprehensive peace with the Palestinians does not understand,” said Lieberman. “It is impossible to solve the conflict, it needs to be managed,” he concluded. It is a given that without the common enemy of Israel, many of the Middle East’s factions would be warring with one another. This is becoming more apparent as a result of the various “Arab Spring” uprisings. Two of Israel’s most active foes – Hamas and Hezbollah – are currently in danger of being swept up in intra-Arab violence that could cripple their respective ability to threaten the Jewish state. In Gaza, Hamas has of late found itself in competition with groups affiliated with Al Qaeda and Global Jihad for the hearts of minds of local Palestinians. In response, Hamas has reportedly started rounding up and jailing its rivals. 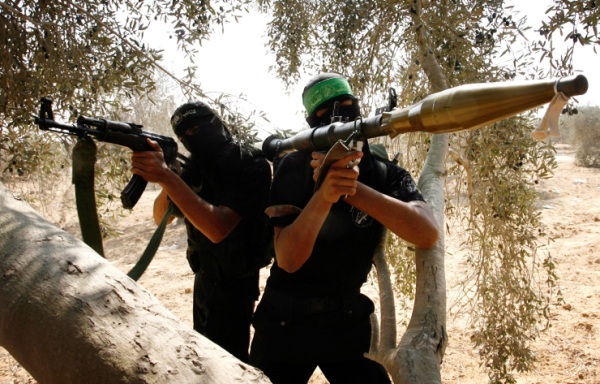 The information arm of Global Jihad has issued a warning that if Hamas does not cease this activity, it’s cells in Gaza will target Hamas interests and reignite violence with Israel, thereby inviting an Israeli assault on the Hamas regime. That according to Israeli monitoring group Terror Watch. Along the Lebanon-Syria border, Syrian rebels battling the regime of Bashar Assad are becoming fed up with Hezbollah’s support for the embattled dictator. Hezbollah forces have crossed into Syria and are said to be taking part in battles against the rebel Free Syrian Army. More recently, Hezbollah began firing artillery across the border. Free Syrian Army officials told the AFP that if the cross-border fire does not stop within 48 hours, Syrian rebel forces will return fire and might even invade Lebanon in order to eliminate the Hezbollah threat. Have the Palestinians Tied Israel’s Hands? On Sunday, several foreign and Israeli news outlets reported that the radical Gaza-based group Hamas was preparing to take over the West Bank, determined to oust the current Western-backed Palestinian leader Mahmoud Abbas. According to reports, the Islamists were emboldened by their recent war with Israel and the alleged victory that followed. Militants claimed that Israel failed to cripple their ability (and will) to launch attacks against civilian targets, with some going as far as to suggest that Hamas left the battleground if not victorious, then at least stronger diplomatically. The movement was also encouraged by the absence of a full-scale ground invasion that could easily have toppled the Hamas regime. To add insult to injury, Israel’s government agreed (as part of the ceasefire deal) to eliminate the so-called “no man’s land”, a buffer zone beyond Israel’s security fence along the Gaza border. The removal of this cordon sanitaire not only left the Jewish state more vulnerable to attacks by Hamas and other terrorists, but will also invited “publicity stunts” by various non-governmental organizations under the direction of Hamas. Nevertheless, there are some who view the recent Israeli operation as successful, and who insist that it was Hamas that suffered defeat. Indeed, two days after the sides agreed to a ceasefire on November 21st, a group of 300 Palestinians approached the fence in the southern Gaza Strip and held a violent disturbance along the border. The army had to use force to disperse the crowds, killing one Palestinian and injuring several others. Another Palestinian was killed in similar developments several days later. Others, such as Dimitri Diliani, spokesman for Abbas’ Fatah movement, insisted Israel had utterly failed in the recent Gaza conflict. “Compared to other Israeli wars [where the country achieved measurable results], the recent operation was not fruitful. It failed to achieve the goals declared by the government, mainly to cripple Hamas’ ability to launch rockets into the state of Israel,” said Diliani. Referring to Hamas’ victory claims, Diliani agreed that although the Palestinian people were dealt a severe blow (the amount of military and civilians losses on the Palestinian side was much higher), they did create the sense of succeeding to defeat the powerful Israeli army on a moral (or even psychological) level. However, Egypt is far from being the only country to support the militant group. It is no longer a secret that Hamas is also backed by Iran (main weapons’ provider) and the Gulf states (particularly Qatar). Encouraged by Hamas gains, the Abbas regime decided to move ahead with its own battle against Israel, this time on a diplomatic level. At the end of November, Abbas approached the United Nations’ General Assembly asking the international body to upgrade his government’s status from “entity” to “observer state.” The request was granted with 138 members (out of 193) voting in favor. But was Abbas motivated by a genuine desire to change things? Experts seem to be divided. “The UN bid gave the Palestinians the feeling that a Palestinian state would soon come into being,” said Frisch. “The Palestinian Authority doesn’t enjoy much credibility in the West Bank,” added the expert suggesting that the move was aimed at boosting Abbas’ popularity. Diliani disagreed, stressing that the move was dictated by the desire to pursue peace, freedom and justice. Although the upgrade didn’t change things on the ground, the UN’s overwhelming support did embolden Abbas, who was given a green light to pursue additional unilateral measures instead of sitting down for talks with Israel that could translate into painful concessions on both sides. In Israel, however, most experts and top brass disregarded Abbas’ move saying it was insignificant. Although it is too early to tell whether the UN upgrade will result in significant changes, Abbas’ flirting with Hamas might. Recent reports suggested that a reunion between Fatah and Hamas (two staunch rivals) was on the horizon. The Palestinian street seems to be favoring the move. Thousands took to the streets in the Gaza Strip to celebrate Abbas’ victory at the UN, whereas crowds in the West Bank rallied in support of Hamas, celebrating the fact that its rockets had struck as far as Tel Aviv and Jerusalem. What could this potential union mean for Israel? Simply put: trouble. Hamas and Islamic Jihad leaders are already preparing for the next round of fighting with Israel, promising that “in the next war, Israelis will be forced to flee not only their homes, but the whole country”. Fatah is also reading itself for a possible confrontation, with some leaders calling for a new intifada [uprising] against Israel, especially in the West Bank and eastern Jerusalem. Can Israel Divide and Conquer? But Frisch was skeptical. “I doubt that Fatah will ever want to reunite with Hamas. Abbas and those around him are scared of Hamas’ potential take-over the West Bank. Although many Palestinians don’t support Hamas, Fatah leaders are afraid of the organization’s strong desire to take control and the ruthlessness with which they are able to do so,” stressed the expert. He That Sits In The Heavens Is Laughing! Shalom beloved Prayer Warriors and Lovers of Israel! Today is the 29 of November, the Historical Day when the UN decided to recognize Israel as a Jewish State in the Land of Israel in 1947. And today the Decision will be made if to recognize the Islamic, terror state of “Palestine”. The enemy is laughing and mocking the very existence of the State of Israel and thus he is mocking the God of Israel Himself. This is a direct affront against the Almighty! As Abu Mazen is right now in the UN and according to the latest news the UN is planned to say a resounding YES to the Palestinians. Their purpose is to get “observer” status in the UN so they can take Israel to the International Criminal Court for war crimes during all the wars that Israel had to fight to defend its existence. Israel has been quite passive about all this as if there is nothing we can do to stop this move. It is not really a surprise that this is happening at this point after the “mock cease fire” imposed by Egypt and USA on Israel after Pillar of Cloud Operation in Gaza. According to the Moslem Hudna, the best time to advance and conquer is when your enemy shows weakness. When Israel agreed to this ridiculous, artificial and deceptive cease fire with Terror after Pillar of Cloud it showed the Palestinians that Israel is weak so it is time to attack politically, a typical Amalek Move. Why is Israel so passive and quiet about this move? What did PM Benjamin Netanyahu promise to Obama? What did Obama promise to Israel? Quite a mystery. Why are even nations like Australia and even UK that were going to say “no” to this move of the Palestinians to be recognized as a State have now decided to support it? Beloved we are fast approaching Zechariah 12 where all nations come against Jerusalem. At first it is a “political move” to force Israel to relinquish its sovereignty over Jerusalem so the UN will have to get in and rule. The issue is that YHVH promises a terrible judgment to all the nations involved in supporting the enemies of Israel. Genesis 12:3, Zechariah 2, Joel 3, Zechariah 12 and more. At this serious point in time it is better to be on the side of Israel and the God of Israel more than ever. In Yeshua’s name! We praise the Almighty whose promises are true and who is standing in Heaven until all of Israel is restored and Messiah Yeshua returns to Jerusalem to rule and reign all the nations from the Temple Mount with a rod of iron. Israeli Prime Minister Benjamin Netanyahu has long been recognized, even by his political opponents, as one of the Jewish state’s most skilled and articulate spokesmen. In 1978 after graduating from MIT, Netanyahu appeared on the American TV program “The Advocate” and debated Palestinian apologist Fouad Ajami, who is today a professor at John Hopkins University. Netanyahu was at the time going by the name Ben Nitay, largely due to security concerns after his brother, Yonatan, was killed while leading a raid to free airline passengers taken hostage by PLO terrorists in Entebbe, Uganda. The following video shows how, even at age 28, Netanyahu was able to masterfully dismantle criticism of Israel for not allowing the creation of a Palestinian Arab state after taking control of Judea and Samaria 11 years earlier. Try as they may to dismiss and rewrite history, Palestinian nationalists and their supporters are left to contend with the very stones of the Land, which are speaking out…in Hebrew! History has always assisted the religious, the ideological, and politicians in their attempts to implement their ideas in real life. Ideologically-driven political actions are most frequently based on texts. The written Law, for example, motivated the people of Israel to take possession of the land of Canaan – and return to it as their homeland in the twentieth century. The first archaeologist in the service of a religiously-motivated emperor may well have been Helena, Constantine the Great’s mother. Combing Jerusalem in search of hard evidence for her faith, she unearthed – among other things – the original cross and the shroud in which Jesus was buried. On this premise, Palestinian reconstruction works inside the Mosque of Omar on the Temple Mount, for example, have transformed the Second Temple structure underneath it known as “Solomon’s Stables” into a mosque. Such a revision of history which seeks to de-legitimize Jewish sovereignty over the entire region hopes to convince the world that the Palestinians are the direct descendants of the Hittites and the Canaanites – and therefore the rightful heirs of the Land. Those who have ears, however, may hear the stones of ancient ruins, magnified through this new column, “crying out” – in Hebrew. A case in point is a 2,700 seal discovered near the walls of Jerusalem’s Old City in 2009. Bearing the inscription “Bethlehem” in ancient Hebrew script, the tiny clay seal dates back to the period of the first Temple – between the eighth and seventh centuries BCE. This is the oldest reference to Bethlehem ever found outside of the Bible. The word Jewish – in case one wonders – is nowhere to be found in this Palestinian version of Bethlehem’s history! Yesterday is gone – tomorrow: who knows? – Today is here! Shabbat Shalom , Behaalotecha – the meaning behind the Temple Menorah‏ – is the Torah portion this week.